The true sign that spring is upon Michigan is not the snow melting. It’s Tigers’ Opening Day, of course! Michiganders can finally crawl out of hibernation to go celebrate the start of the spring season by cheering on our beloved Tigers in Comerica Park. 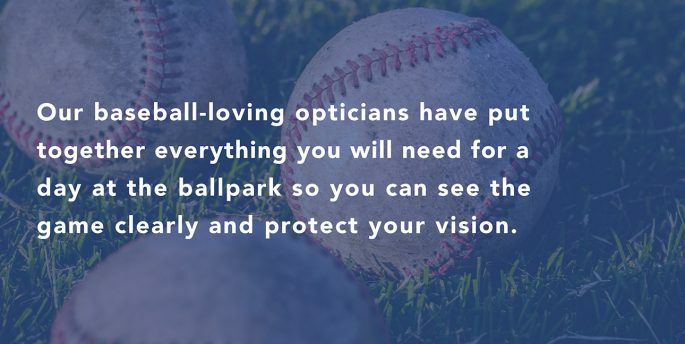 Our baseball-loving opticians have put together everything you will need for a day at the ballpark so you can see the game with clearly and protect your vision. To enjoy the game, you’ll want to have great seats, which is why we’ve conducted extensive research on Comerica Park to find the perfect spot. Our studies show that the best view of the diamond is on the lower level, between the dugouts, in sections 120-135. Or, if you prefer an elevated view and a padded seat, head to sections 321-333 for your ideal tickets. If you are headed to another ballpark (we won’t judge you unless you’re headed to Cleveland), keep in mind while buying tickets that the best view for almost all ballparks is on the lower level between the dugouts. No matter where you are sitting, binoculars are a game day must. The game is much more exciting when you can see the reaction of players’ faces. Plus, binoculars make following the position of your favorite player much easier. Having binoculars will keep you from squinting your eyes at the large screen or down at the field, which we all know isn’t good for your vision. Because we are avid baseball fans, we researched the best binoculars for viewing baseball games. These binoculars give you a wide field of vision, meaning that you can see what is happening across the whole field instead of zeroing in on one section. Protect your eyes from dangerous UV rays with a pair of prescription sunglasses and see the game without glare. Even though it may not be a high of 75 on opening day, the sun will still be shining and putting your vision at risk. A quality pair of sunglasses will help you enjoy the game even more. Stop in and ask our opticians about which frames are the best for watching the game. Continue to protect your vision with a hat. The bigger the brim, the better for your eyes. What better way is there to support your team than wearing a hat with the iconic “D” on it? Shield your eyes from the sun and cheer on the Tigers, all in one go. This is a game day essential. If you don’t bring a baseball glove into the stadium, are you even a true baseball fan? Not only will a glove increase your chances of catching a fly ball, it can help to protect you from any rogue fouls that may be aimed for your face. It sounds far-fetched, but accidents happen! Keep your glove with you to protect your eyes, and you might even leave with a game day souvenir. Our expert team is here to ensure that you are able to see the game with clarity, even if you’re a Cleveland Indians fan. Are you headed to Detroit for Opening Day? Stop in for an eye exam to make sure that you have the best vision for the game. While you’re here, grab some sunglasses, too. Stop in to one of our 54 locations or call us to set up your appointment today!